An innovative mHealth project called MOS@N is helping vulnerable populations in the Nouna district of Burkina Faso enjoy better health and greater access to health services. The project has also enhanced the status of women health workers by overcoming deep-seated gender biases. “Marraines” (godmothers) have become central players in health education and mobilization — roles previously played by male community health workers. They are older women who have been chosen by their village leaders to accompany women through their pregnancy and childbirth, acting as intermediaries between their community and health workers. MOS@N, a fusion of the words “mobile” and “santé” (health), has also empowered women to make decisions about their health and that of their children. These accomplishments reflect strong community engagement in the project. The MOS@N project was launched in 2013 to improve access to quality care for mothers, children, and people living with HIV/AIDS in Burkina Faso. Despite significant recent improvements in this landlocked West African country, high maternal mortality rates remain a major public health problem: in the rural Nouna district, for example, there are 341 maternal deaths per 100,000 live births. Only 70% of women receive prenatal care and 34% give birth at home rather than at a health centre. HIV/AIDS rates remain high, and as many as 30% of those infected don’t follow up with required treatment. Obstacles to accessing maternal care include distance to health centres, shortages of skilled health staff, lack of information on sexual and reproductive health, and the high cost of medical treatment. Health information provided to pregnant women and health providers is often not delivered at the right time or is not up-to-date. Deep-rooted paternalistic social values in the community also lead many men to forbid their wives to “waste their time” at the health centre when they could be working in the fields. 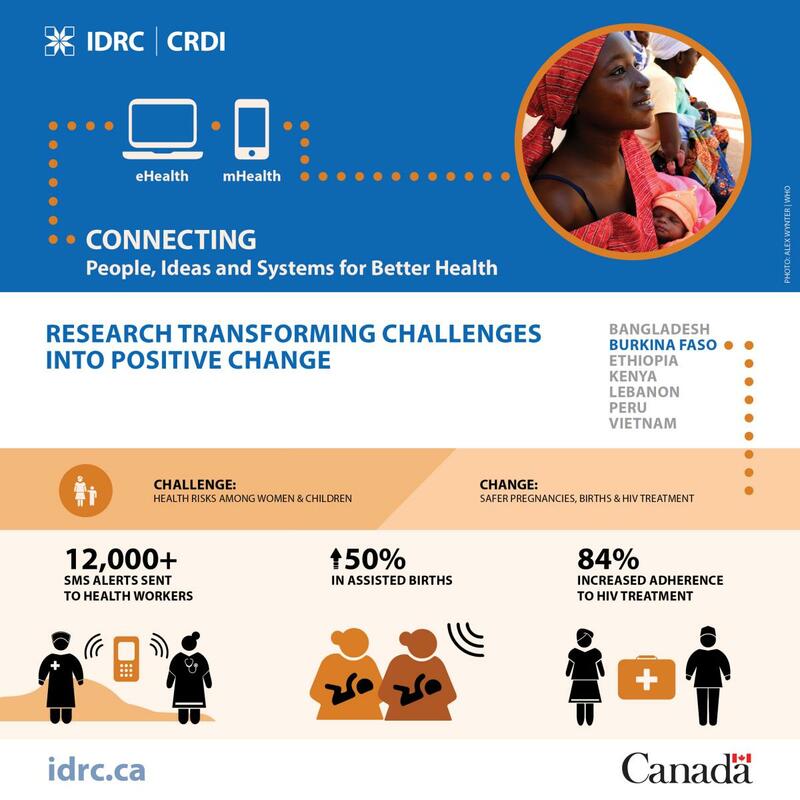 In 2013, researchers from the Centre de Recherche en Santé de Nouna, a Ministry of Health research institute, set out to determine if the use of information and communication technologies, notably mobile phones, could improve health governance and lead to more equitable access to health services. Funded by IDRC and carried out in collaboration with the University of Montreal, the MOS@N project is a mobile phone communication system deployed in five health centres serving 26 villages. MOS@N emphasizes the community’s role in delivering treatment, monitoring patients, and delivering awareness-raising messages and reminders. To do so, the project brought together local primary healthcare centres, health workers, ICT technicians, godmothers, community leaders, and public health researchers. The MOS@N platform, developed locally using open source software, enables access to information about maternal and child healthcare and living with HIV. Text and interactive voice messaging systems issue messages in five local languages to ensure inclusiveness and greater accessibility. All messages follow national guidelines for pre- and post-natal care, assisted delivery, vaccination against polio and tetanus, malaria prevention, and patient follow-up. The content was customized to meet the needs of users — women and young children, new mothers, and persons living with HIV. Mothers receive appointment reminders automatically. Among other features, a core health information system was developed and integrated in district health facilities to collect data needed for follow-up and decision-making. The project found novel ways of overcoming technical and social obstacles. On the technical side, solar recharging systems were installed in health centres and provided to community health workers to counter the erratic electricity supply. When the Internet could not be accessed, data was stored on USB sticks and later uploaded into the central server at project headquarters. Many women in the area have limited access to mobile phones, and in many cases, husbands or other members of the family have a phone, but women are given very little opportunity to use it. The social side of this project ensured that husbands were sensitized to the project from the beginning in order to overcome their reluctance to allow their wives to use mobile phones. This reluctance on the part of husbands also applies to godmothers. Godmothers themselves mentioned that their mHealth duties could be a source of conflict within the household. To avoid disagreements, only women whose husbands had consented were selected. Community women were also given the choice of listing or not listing their phone number in the system to receive calls. Women’s groups and all levels of health workers were integrated into project design and monitoring. Ongoing training during monthly monitoring visits helped hone health workers’ technical skills in using the system and in understanding message content. In all, more than 90 health workers and 62 community members were trained. The introduction of mHealth services was warmly welcomed at all levels, from the local community to the central Ministry of Health. But first, researchers had to overcome a major hurdle: women’s inferior social status. This prevents women from making their own decisions about many issues, including healthcare. The strategy was to foster education and communication at all levels: in the home, between spouses, in villages, in health centres, and in community health associations. The participation of husbands was sought to implement the project. Godmothers were at the heart of the work, with 52 recruited to raise the awareness of mothers and to encourage them to seek healthcare. Ten other health workers were entrusted with HIV follow-up. The MOS@N network also includes 50 health officers and 38 resource persons. Providing godmothers with mobile phones and bicycles helped raise their social, economic, and professional status in the community. It also increased their ability to make decisions within their own homes. Because of their recruitment and training, they were able to assume activities such as vaccination promotion that was previously carried out by male health workers. As a result, godmothers and the women they serve are now empowered to make decisions about their health and that of their children. The numbers testify to the project’s success in strengthening the health system and improving access to care. By the end of 2016, 2,161 pregnant women had received prenatal care. Assisted childbirths increased by 50% to 97.5%. Close to 260 patients living with HIV had been followed by health workers and the drop-out rate was low — only 1.6% of cases. MOS@N also increased equity and participation in health governance. Women were central to the project’s implementation and helped determine the maternal and child health services offered. Stronger direct contacts with the health centres and ready access to information will help them maintain the gains made. 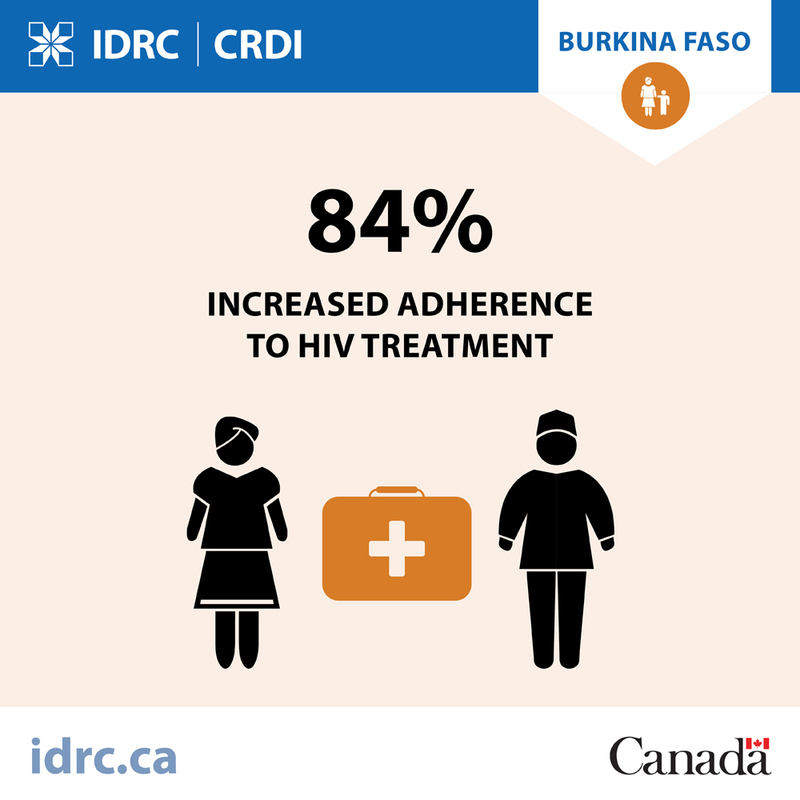 Read more on mHealth and governance in Burkina Faso.